Here today, but not tomorrow. This roll-out will effect users worldwide in all languages and will bring the desktop experience closer to the mobile experience, although whether the amount of ads shown to mobile users will increase hasn’t been confirmed. So what does this mean for marketers and users alike? Well for regular users, the right-hand space will still be utilised for Product Listing Ads (PLAs) as well as Knowledge Graph Boxes, so you probably won’t notice much of a difference there. However the continual ‘pushing down’ of organic listings will certainly be an issue for many of us. For Paid Search advertisers the change will certainly drive up average CPCs as the competition for the top slots increases. It’s gonna get ugly. So why limit the amount of space for advertisers on its SERPs? The “complete and permanent” roll-out will be finalised on 22 February. 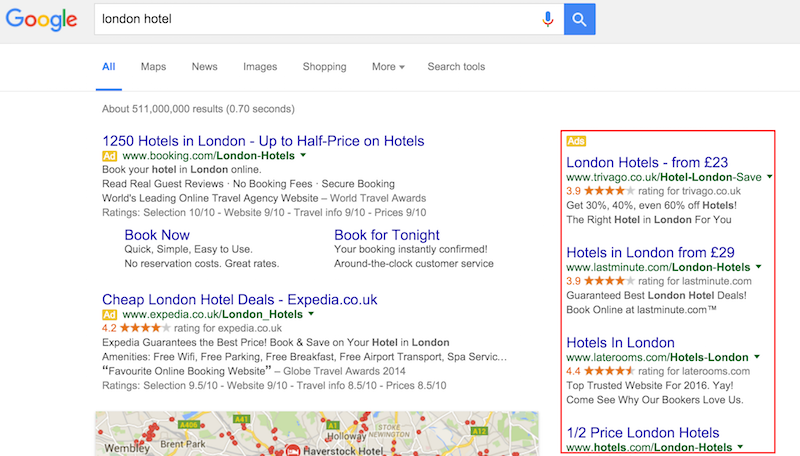 For more in-depth analysis, read our expert opinion on Google killing Right Hand Side Ads.